Stay Productive in the 2018 Ford F-150 | Rhinebeck Ford Inc. When you're driving a full-sized pickup truck, having access to driving metrics is important. Luckily, the 2018 F-150 has you covered. 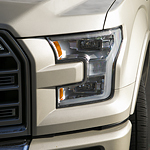 This popular truck from Ford is available with an advanced productivity screen built into the instrument cluster. This system comes standard on the LARIAT, King Ranch, Platinum, and Limited builds. It's also optional for other models. It utilizes an 8-inch LCD screen that's positioned in the center of the two gauges. This screen can be customized to display information that's most important to you. You can set it up to show trip information, towing data, speed, off-road settings, and much more. Flipping through the various screens and options is a cinch thanks to the controls built into the steering wheel. See how the 2018 Ford F-150 can change the way you drive by visiting us at Rhinebeck Ford Inc. Stop by our showroom in Rhinebeck, NY to take the F-150 for a test drive.